Tech companies gave platforms to conspiracy theorists like Alex Jones. Is the crackdown finally here? Some of Silicon Valley’s social-media titans acknowledge that their services have become breeding grounds for foreign espionage, white nationalism and conspiracy mongering. Reluctantly, the companies have taken on a 20th-century role: gatekeeping. For more than a decade, tech companies have built massive social-media platforms on a simple principle: Take the power of publishing that was long reserved for traditional outlets like newspapers and television stations, and give it to everyone, without censorship. But that era of idealism appears to be over, as some of Silicon Valley’s titans acknowledge that their services have become breeding grounds for foreign espionage, white nationalism and conspiracy mongering. Reluctantly, the companies have taken on a 20th-century role: gatekeeping. 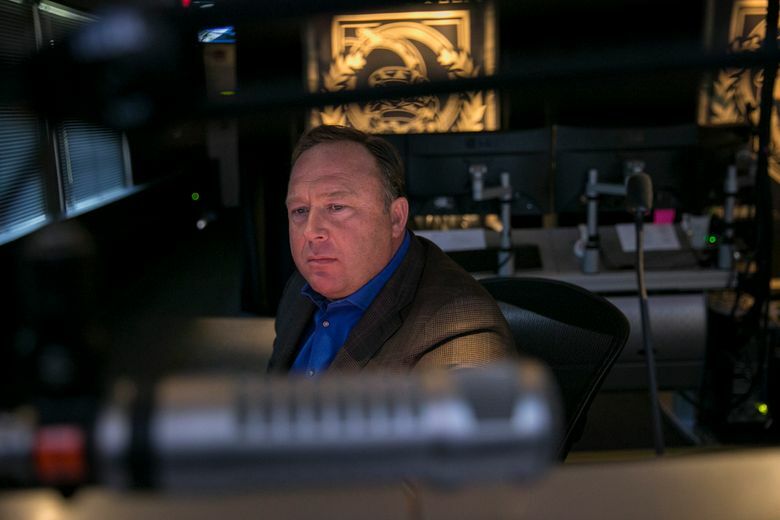 On Monday, Apple, Facebook, YouTube and Spotify kicked prominent conspiracy theorist Alex Jones and his popular Infowars outlet off their services after years of mounting public pressure for the media giants to take more responsibility for the content that appears on their wide-open platforms. Since the 2016 election of President Donald Trump, tech companies have responded to lawmakers and activists, and taken steps to identify and remove accounts linked to white nationalists who grew emboldened by Trump’s campaign and Russian hackers who federal officials say aided his election. But the move against Jones — a Trump supporter whose impassioned paranoia has drawn millions of followers — marks a clear escalation in Silicon Valley’s attempt to clean up its mess. YouTube explained its action in similar, if more legalistic, terms. But to Jones and his supporters, there was another way to describe what had just happened to him: liberal censorship. Jones has been a controversial figure for decades, and few personalities have benefited more from the way that Silicon Valley has shifted publishing power from traditional media into the hands of everyday Americans. Part ringmaster and part libertarian activist, Jones is known for animated tirades alleging that the Federal Emergency Management Agency wanted to put Americans into concentration camps; that the 2015 “Jade Helm” military exercises in Texas were actually preparations for the “Homeland Eradication of Local Militants”; and, most notoriously, that the 2012 Newtown, Conn., mass shooting at an elementary school was an elaborate hoax. His claims have drawn multiple defamation lawsuits, including some from the parents of victims at the Sandy Hook Elementary School, who say they have been harassed by “truthers” suggesting the massacre never happened and that the families are feigning their grief. But Jones’ following on Facebook, YouTube and Twitter only grew, particularly among the right wing. Trump consultant Roger Stone later received his own program under the Infowars banner. After Trump ascended to the White House, it became harder to dismiss Jones as a fringe figure. With nearly 2.5 million subscribers to his YouTube channel, he was competing with, and in some cases surpassing, the mainstream news outlets that had previously ignored him. The sudden bans signal that the political winds have shifted for tech companies that for years had profited from Jones’ presence on their services. The democratizing of media is “not necessarily a bad thing,” but “something has gone horribly wrong” when figures like Jones and Richard Spencer — one of the nation’s most prominent white nationalists — gain prominent followings on the platforms, Ghosh said. Tech companies are perfectly within their rights to kick Jones and others off their platforms, said Theodore J. Boutrous Jr., a partner at Gibson Dunn who frequently litigates First Amendment cases on behalf of an array of media organizations and technology companies. Federal law generally protects social-media platforms such as Facebook from legal exposure in the types of defamation lawsuits Jones has faced, Boutrous said. In explaining Twitter’s decision not to cancel Jones’ account, a representative for the company suggested other Twitter users were keeping Jones in check in his replies by fact-checking him. What of the other conspiracy theorists online? For the social-media companies, cracking down on Jones carries risks of alienating his many followers who remain on the platforms. Jones may be the most prominent conspiracy theorist in the media, but he is far from the only one online. It is unclear whether the companies will target other users who share similar views — which would be a massive undertaking, even for a company as large as Facebook. Antonio Garcia-Martinez, a former Facebook product manager and author who considers himself a “free-speech absolutist,” said the company “was probably right to ban him” for outrageous speech. Although banning Jones certainly limits his ability to reach his massive audience and to spread new conspiracy theories, it doesn’t do much to address the conspiracy theories that are already circulating among the public, Garcia-Martinez said. He cited the popularity of “QAnon,” a convoluted new theory alleging that Trump’s enemies will all be arrested. The parents of Sandy Hook victims welcomed the bans but wish they had come sooner.